A book is like a garden which you may carry into a pocket ~ Arabian proverb. This book is part of a series of works using my botanical alphabet. I developed it in one of Thomas Ingmire´s workshop in Seattle, 2004. The work is fragmented into ten parts which go into envelopes. The work can be put together the way it was meant by the artist or it can be assembled on a personal basis. Gouache on Arches Text Wove paper. The book is wrapped on Amate (mexican paper) and silk ribbon. Concertina binding with hard covers on handmade papers by Carlos Quesada. 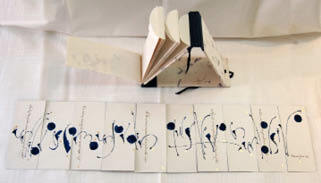 Marina Soria is an Argentine calligrapher, book artist and painter. She has a BA in Fine Arts and a degree in Graphic Design. She teaches Graphic and Editorial Design, Typography and Calligraphy at the University of Buenos Aires. She studied calligraphy in Europe and the United States, and is a founding member of Calígrafos de la Cruz del Sur, the first calligraphic guild in South America. Her work is in public and private collections around the world.